BTX is excited to connect with you through our quarterly newsletter. We’re constantly growing our ecosystem, in order to make BTX more accessible for both institutional and retail users. On that front, 2018 was an incredible year, and 2019 started with new integrations of BitCore. We forged high-quality partnerships with organizations spanning various use cases. Here, you will find integrations, listings, updates on our activities, news from the BitCore Core Team. BitCore community believes in us and supports our moves. Thank you for your support/votes for Block DX listing. Mike Nesbitt from BitCore community made this informative video: https://www.youtube.com/watch?v=tbbaKoxjDNA&feature=youtu.be. Thanks Mike! BitCore team and community are active on social media spreading awareness about BTX; we always try to expand our community and geographical borders. Therefore, we created a NEW BITCORE telegram groups for our Turkish, Slovakia and French community (Join the new groups). Over the past several months we’ve updated several pieces of content on our website, in particular the main page, as well as the Ecosystem. These types of updates require timeliness, and so remain ongoing. Our goal for the website is to share updated content and to give users a quick and easy place to find answers. We want to make discovery of the projects throughout the BitCore ecosystem seamless and give developers the tools they need to build best-in-class products. The website also features BTX’s new roadmap, which details BitCore’s developments and and future milestones, including Evolution (https://bitcore.cc/introduction/roadmap/). The number of ways to access and hold BTX are constantly growing, and each month we’re excited to add new listings for the BitCore. We are pleased to share that BitCore has been listed on three new exchanges Block DX, Reflextrader and Equicex. Block DX is the first true decentralized exchange that enables trading freedom for connected blockchains. Bitcore is tradeable with all the cryptocurrency supported by the BlockDX (https://blocknet.co/bitcore/). Equicex exchange listed Bitcore for trade to over 300 cryptocurrencies. (https://www.equicex.com/). This is will be a very exciting avenue for the Bitcore community to purchase and trade their crypto! Reflextrader belongs to CointoPay Company that provides BTX trading against BTC (https://www.reflextrader.com/tradeview/BTC_BTX). Moreover, HitBTC increased the decimals from 6 to 9 for BitCore BTX trading pairs. This had a positive impact on trading and prevents the walls move quickly and possibly disappears. 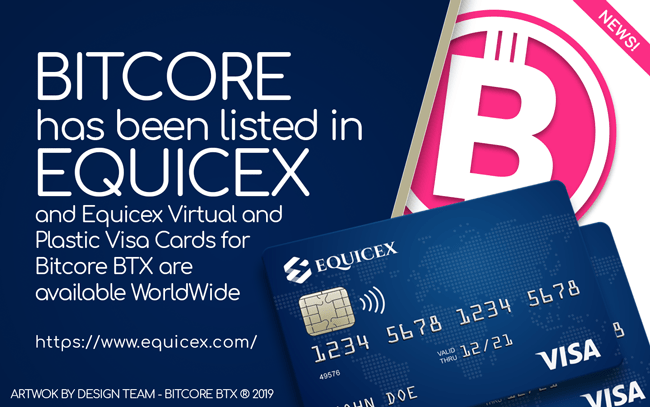 Equicex prepaid cards are available for BitCore BTX, clients are able to deposit BTX directly into plastic card and virtual card, and convert automatically to fiat currencies like EUR, GBP and USD (https://www.equicex.com/prepaid-card/). 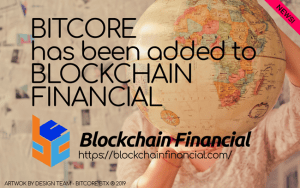 Blockchain Financial: BitCore has been integrated to Blockchain Financial. Use Blockchain Financial as your online BTX wallet and send/receive BTX throught CryptoWiz! (https://blockchainfinancial.com/). Magnum Wallet: BitCore has been integrated into Magnum Wallet. 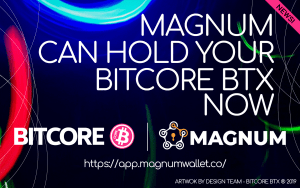 You can store, send/receive your BITCORE BTX coins (https://app.magnumwallet.co/). Users have full control over their private keys. The project continues to be focused on the payment sector and really delivering on the “currency” promise of the term cryptocurrency. BitCore has announced two new integrations this quarter, and each one takes the currency a step closer to real-world adoption. 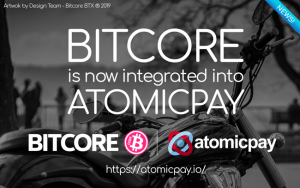 AtomicPay: The decentralized cryptocurrency payment processor AtomicPay, which functions on the WooCommerce, OpenCart and PrestaShop modules/plugins, now supports Bitcore to expedite real life adoption of BTX globally. AtomicPay allows merchants to accept payments in cryptocurrency without requiring private keys (non-custodial). Therefore it doesn’t store client funds. This feature is one of the competitive advantages of it. They make things simpler for merchants at http://atomicpay.io. CointoPay: Online stores and services can now accept BTX as payment with Woo Commerce, Shopify, Prestashop, OSCommerce, Magento2x, Zencart, Blesta (see more: https://github.com/Cointopay). 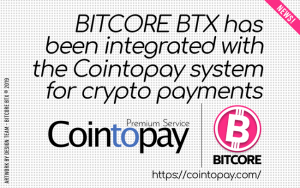 You can start to sell services and prod ucts with your own Cointopay account and enable BTX as payment method. With the Point of Sale (POS) Android app from Cointopay.com, you can accept orders and receive crypto currency payments from your customers. Of course, we can’t grow our ecosystem if we’re not investing in the digital asset community. To this end, we took part in a Mallorca Blockchain Days. Thus, we interacted with likeminded individuals, we managed to make some very beneficial contacts, and in addition we had some great talks with people from several different blockchain enterprises (for more details: https://bitcore.cc/mallorca-blockchain-days-brought-the-bitcore/). On the other hand, we continue our educational seminars in Venezuela. Our aim is to teach people about blockchain technology and BitCore, and help them to start in this amazing new opportunity. Venezuela will be BTX´s territory! Have a look our other success stories in Q1. 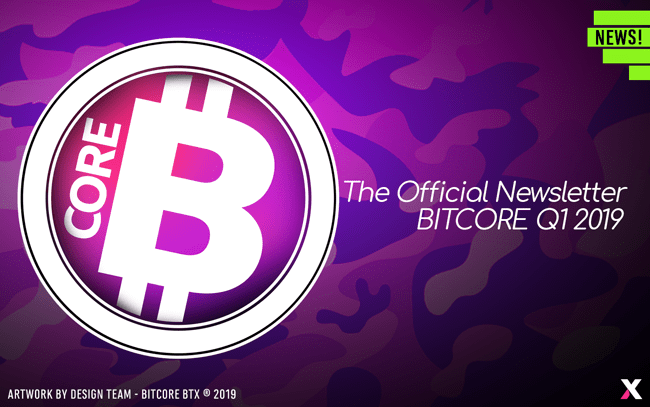 BitCore BTX has announced a new version of the Electrum-BTX. See release notes here: https://bitcore.cc/electrum-btx-3-2-3-with-bip32_prime/. Russian version of white paper released 20th of March 2019. BitCore is at Medium, follow and read latest news about BTX on this prestigious website (https://medium.com/@BitCore_BTX). Revain (http://Revain.org) review platform for crypto community has listed BitCore. Please let’s write some reviews about BTX. https://revain.org/projects/bitcore​. Livenet; BitCore Machine released. Livenet displays any block and any transaction (TXID) in different sizes. The idea is to visually show the Bitcore blockchain for educational purpose. Let’s have a look at https://bitcore.cc/livenet/. Bitcore giveaway rewards are distributed to winners.